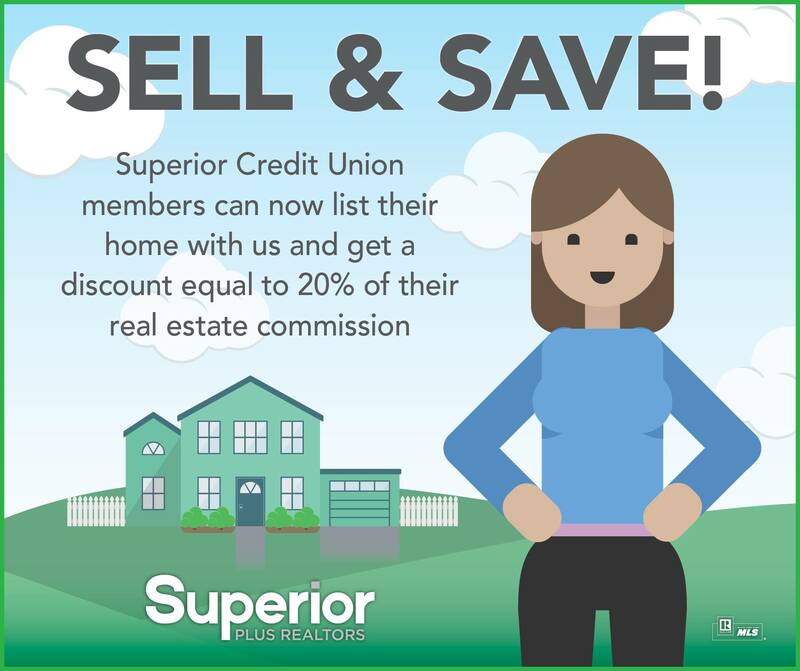 Member must have an active checking account and/or current mortgage loan with Superior Credit Union, Inc. to qualify for a discount equal to 20% of the real estate commission paid to Superior PLUS Realtors. This discount is only on the portion of commission earned by your Agent at Superior PLUS Realtors. Discount does not apply to the amount of commission split with other real estate brokerages in a dual agency transaction. This discount may not be combined with any other rebates or negotiated reduction in commission percentage. This will not affect the amount of commission earned by the buyer’s Agent and will not reduce your Agent’s income. Homeowner understands that participation in this discount program is completely optional and that they are able to withdraw from the discount program at any time prior to closing. Participation will not affect any rates, fees, or other costs associated with the sale of your home, or any other services provided by any affiliate of Superior Credit Union, Inc.
Superior PLUS Realtors is an affiliate of Superior Credit Union, and Superior Credit Union may obtain a financial benefit from your use of these services.